Yep, That Old Lipton Onion Soup Pot Roast Recipe is the pot roast my Grandma made, my Mom made and that I make, too. It’s a kind of no-brainer make the pot roast and get it in the oven or the slow cooker and forget about it kinda meal. 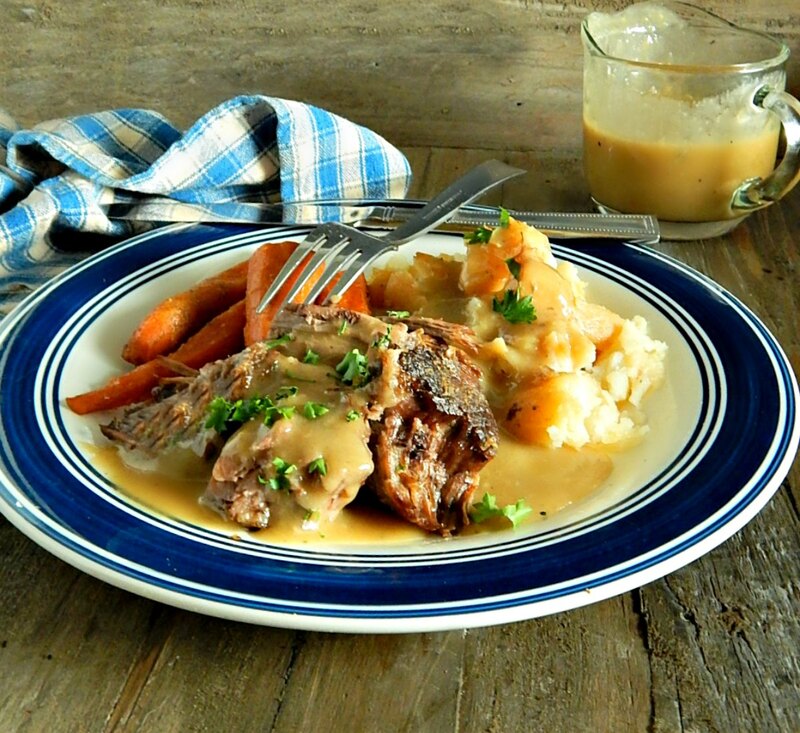 The best pot roast ever for any fall or winter day! Now and then I get asked, “What’s American food?” And by that, I don’t think people mean food recipes that morphed into being here in the States. It seems they’re more curious about what the average (as if there is an average?) American eats. Everyone probably has a different answer, depending on where they’re from. For me, the thing that comes to mind first, being from the Midwest, is “pot roast.” And specifically, That Old Lipton Onion Soup Pot Roast Recipe. There really is nothing too special to know about making That Old Lipton Onion Soup Pot Roast Recipe. I love cooking it in the oven but it’s just about as good tossed in the slow cooker. If you’re slow cooking, cook the pot roast all day on low so it’s ready when you get home from work, or maybe toss it in on a weekend day on high for a few hours so it can bubble away while you’re running errands. The chuck roast can be browned first. I usually do that, and I used to do that sometimes the night before (and peel the potatoes & carrots and put them in the fridge in a container of water so they wouldn’t turn brown) if I wanted to make That Old Lipton Onion Soup Pot Roast Recipe in the Slow Cooker before I left for work. When I make That Old Lipton Onion Soup Pot Roast Recipe in the oven, after I brown up the meat, I toss in the potatoes and turn them so they’re all coated with that flavorful oil. Then when I check the pot roast, about 3/4’s of the way through the cooking time, I give them another turn. It makes the potatoes especially delish. They get so nicely browned and a little crispy on the edges. You won’t want to do that if you’re cooking it in the slow cooker, though, because lifting that lid slows the cooking process down too much. Much as I love Pot Roast I gotta admit some of these old-school country type meat & potato meals don’t always give the best “bang for your buck,” even though the Chuck is one of the least expensive cuts, sometimes less than ground beef. Shop for your meat well, picking it up when it’s on sale. Try to squirrel a little bit of it away for a second meal before it’s served; you won’t need much (about 2 cups of chunked pot roast) to make my My Bourbon Barbecue Pot Roast Sandwiches or a Pot Roast Shepherd’s Pie. In my house, if I were to put the whole roast out on a platter, it would absolutely be inhaled with no leftovers at all, and a few leftovers are key to stretching that pricey protein over two meals. I like to plan for the leftovers and buy the ingredients at the same time when I make pot roast or any “big protein” meal. Serve your roast with lots of sides; potatoes and carrots are not only traditional, but they’re also really some of the cheapest of veggies! Buy them in larger bags and the per pound price is usually less. It wouldn’t hurt to serve That Old Lipton Onion Soup Pot Roast Recipe with a green salad or veggie, either. And if you’re going low carb, think about my Parmesan Mashed Cauliflower. Use it in place of the potatoes if you want, but goodness help me, I want the potatoes!. Heat the oil in a 12-inch ovenproof skillet over medium-high heat. Add the beef and cook until well browned on all sides. Sprinkle with Onion Soup Mix. Tuck the potatoes in around the roast, turning to coat with oil. Add the carrots and celery. Pour enough water in to reach halfway up the side of the roast. Cover tightly and place in oven. Braise for 2 1/2 to 3 hours, until fork tender, checking the liquid level about 3/4’s of the way through. Remove beef & vegetables to a platter and cover to keep warm. Pour the juices from the skillet into a large measuring cup. Allow fat to settle on the top and skim off, adding about two tablespoons back to the skillet. Place skillet on a burner and heat to medium-high. Sprinkle flour over the fat and cook, stirring often, until the mixture starts to appear dry, about two minutes. Top off the drippings in the measuring cup with beef broth for a total of two cups, and a splash of wine, if desired. Whisking vigorously, pour the drippings into the pan. Bring to a simmer and cook until thick enough to coat the back of a spoon, leaving a distinct line when a finger is run through. Taste and adjust seasoning. Heat the oil in a 12-inch ovenproof skillet over medium-high heat. Add the beef and cook until well browned on all sides. Place beef in slow cooker. Sprinkle roast with Onion Soup Mix. Tuck the potatoes in around the roast. Add the carrots and celery. Pour about 2 cups of water into the skillet the beef was browned in and scrape up any brown bits from the pan. Pour into the crockpot. Add additional water to reach halfway up the roast. Cover and cook on low for 8 to 10 hours or high 4 to 5 hours. Remove the beef and vegetables from the cooker, cover and keep warm. Set the slow cooker to high and cover with lid. In the meantime, add flour to measuring cup and slowly add about a cup of beef broth, stirring to mix. Add a splash of wine if desired. Add mixture to slow cooker and whisk, until mixture thickens enough to coat the back of a spoon, leaving a distinct line when a finger is run through. Taste and adjust seasoning. I’ll be sharing That Old Lipton Onion Soup Pot Roast Recipe at Fiesta Friday #242, cohosted this week by Jhuls @ The Not So Creative Cook and Jen @ Apply To Face Blog. You’re going to love all the bloggers that share their best recipes of the week at Fiesta Friday but do drop by and see Jhuls. You’re going to love each creative recipe and take a sec to stop by and see Jen. She’s going to have you in stitches with a helping of her real-life stories along with each recipe. This entry was posted in Click here for Bargain Meals, Click here for Fabulous Food Posts and tagged Beef, Carrots, Chuck Roast, complete skillet meal, Pot Roast, Potatoes, Slow Cooker. Bookmark the permalink. Thanks for letting me know, Lisa. Glad you like it otherwise, though. I think this being a recipe from”back in the day” it was kind of the expectation that the veggies were going to be really soft but that was kind of balanced out by the ease of tossing it in the pot all at once and cooking it. Yep, this looks like the pot roast I grew up eating Mollie! I think old school American food is meat and potatoes– like this post roast. But now, who knows??! When we lived in Spain a neighbor in our apartment building saw me making hamburgers through our kitchen window. The next day she came over asking could I show her how to make hamburgers!! Her idea of real American food!! ha! Fun nostalgic post! hugs Mollie! How fun to share burgers with her, lol!! I think food would have stayed so much more regional and different regions might have developed more distinct styles if we didn’t have first, such a mobile society and second, the internet! Great! We’re all over the place in temp here! Turned the furnace on for the first time. I woke up in the middle of the night just freezing! Oh my, I had forgotten the pot roast of my past. Thank you for the beautiful remnider. It is an oldie but a goodie, and so much better than you might think, being so simple. I remember making this with my Mom when I was a teenager, so distinctly that it was almost like she was still with me, showing me how to brown the meat and chatting as we peeled what then seemed like a mountain of potatoes and carrots to get through. What a treat for sore eyes Mollie!! Wow-weeeeeeee! I love a good pot roast, those potatoes look amazing! I might be inclined to use your homemade onion soup mix as the one in the packet is just laden with sodium 🙂 Guilty here using that in the past, but now with health issues and trying to keep sodium to a minimum, your homemade mix looks like just the ticket. Look at all those leftovers, so impressed! They all look amazing! Thanks so much, Loretta. I do love this pot roast and am right with you on having to watch things! I think I might need to go vegan! Actually I practically did for about 9 months and my chloresterol levels didn’t even budge. Go figure, huh!! Love this recipe! I grew up with this for Sunday dinner. Thanks for the reminder! My pleasure Robin! It was fun to have again, and you know how some recipes don’t live up to the memory? This one does! The spicing is very unique depending on who’s making traditional New Mexico green chile stew. Some people add cumin, some add oregano, some add thyme, some add cilantro. Very much a matter of taste. I personally think it needs nothing more than onions, garlic, chicken bouillon paste, the tomatoes and a good, long 5 hour simmer. It’s also tasty paired with New Mexico style pinto beans slow simmered with a ham hock and some flour for a bit of thickening. Ok, now I’m getting hungry! Yum! Either a packet of onion soup or a packet of ranch seasoning are good in meatloaf. As far as the green chile chicken stew goes, I haven’t yet made it for the blog because I haven’t found an appropriate book reference, though with the fall and chile roasting season upon us, I’m going to try really hard to find one. It’s super simple, just like regular green chile stew except instead of using pork cubes, I use chicken thighs cubed. But the diced tomatoes, chicken broth, potatoes, green chile, onions and garlic……..all of that is the same. I have had green chili in diners and restaurants through New Mexico and Arizona although that was 25 to 35 years ago. And I did notice that a lot have potatoes. That was before, I think, so many ingredients became so readily available and worked their way into recipes. I believe you can get hatch green Chile shipped pretty much anywhere in the world. Let me know if you’d like me to find you a link or 2 for some companies that will send it your way. Such an interesting post Molly! That question about what is American food stumps me every time. Can you believe that I had heard of this Lipton onion soup mix pot roast but never made it? I will try now. Does it work well with chicken as well? I have not tried it with chicken but recently saw a recipe for “french onion” chicken that used it and thought it sounded and looked delish. I didn’t save or bookmark it though or I would pass it on. I’m old enough to remember a friend’s Dad grumbling about being served “foreign” food when my friend’s Mom made spaghetti back in the 60’s! Memories, that what you just invoked and good ones. Memories of Sunday Lipton onion soup pot roast dinners from long ago and a meal I’ve not had in some time. Thanks for reminding me and providing your excellent recipe. I think it was a discussion with you, Ron, that made me think of this!! Thanks! lol! Not if you have a crock pot, haha!! I’m sad for you, lol!! 🙂 Funny thing was, I madee this, ate for days off of it, now it seems strange to be posting the recipes, because I’ve had my fill and am done with it!